consumption of Coca-Cola with its lovely bouquet of caffeine. The ride is very smooth, and this train yields a superior experience compared to Amtrak as far as the ride and the comfort of the cabin go. Unlike our last Russian train, there is no bulky mattress to contend with. The beds merely fold out and the seat cushions function as a mattress. I am on one of the top bunks. It's quite comfortable. Dan and Alexey are on the bunks below. I get up, put on my jeans, descend the little ladder, and make my way to the bathroom at the end of the car. We stopped briefly at the station in Tyumen. I clear a small section of the table and have a little morning Coca-Cola. Dan and Alexey get up. It is nearly noon. We were all a bit worn out from the travel, I think. We eat some cookies for breakfast and have tea. We enjoy more good conversation regarding the history of Lutheran Christianity in Russia - especially recent history regarding the Lutheran Church of Ingria and the situation of fellowship with the Missouri Synod. I have been copying notes from my pocket moleskine into my leather journal, and I am finally caught up! Dan is reading Dostoevsky's Crime and Punishment on his Kindle. Alexey is scanning his Lonely Planet Guide to Russia - which he finds to be so-so. We are having a brief technical stop, as explained by the staff, to empty the toilets (in some matters, Russians do not shy away from "TMI"), after which we will be in Yekaterinburg (in about 12 minutes). I need to pack up! We arrive at Yekaterinburg on time. The staff is competent and polite. We exit the train and go into the rather run-down train station. The signage is bilingual. We make our way outside and cross the street to the parking lot. The Rev. Sergei Glushkov meets us there, and we pile our things into the back of his small but nice mini-SUV. Our drive takes us past the main square - as evidenced by the Lenin statue and the impressive Soviet-era administrative building. There is also a shiny new Orthodox church nearby - and a Traveler's Coffee. The attire seems to be a little more casual here than in Novosibirsk. There are not as many high-heels, although the dress is still on the stylish side. There is a lot of western influence here. We passed a large Subway restaurant - which I understand is quite popular in Russia. However, the business model is different. You have to pay for each topping and condiment. Father Alexey explains that if something is free in Russia, people will take it - even if they don't like it. The idea of "free refills" on drinks in the U.S. is inconceivable to the average Russian. There is a huge number of restaurants int he downtown district, and a lot of advertising. My first impression of Yekaterinburg is that is has the feel of being a much bigger city than Novosibirsk - when in fact it is smaller. 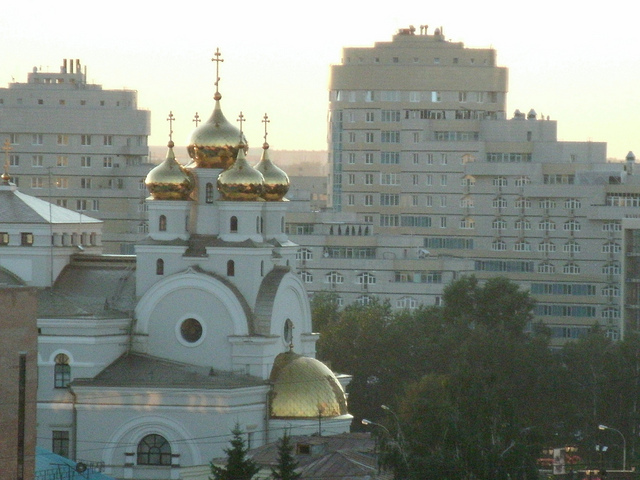 Novosibirsk is actually the third largest city in Russia after Moscow and St. Petersburg. 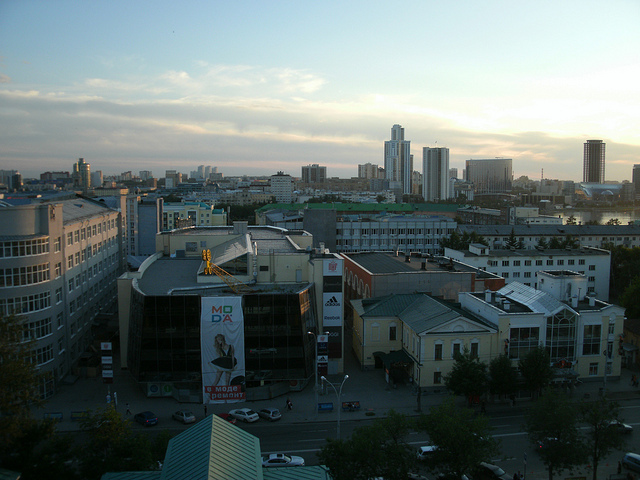 Yekaterinburg is the biggest city in the Ural region. Technically, we have left Siberia. A cafe outside advertises "Интернет 24" (meaning 24-hour Internet) and a sign says "Free Wi-Fi Spot" (in English). There are huge shopping centers. One has a large theater and a water park (Аквапарк). We make it to the church flat. It's a small apartment, and one of the rooms is the sanctuary of Sts. Peter and Paul Lutheran Church. It is simple and yet churchly. There is a large, elegantly hand-carved crucifix. There are kneelers. In a side room in a model of the old Sts. Peter and Paul building - which was demolished by Stalin in the late 1930s. This parish is a continuation of that parish, but unlike many Russian Orthodox congregations, has not received any restitution from the government. We head over to a mall food court to eat. We settle on the not-so-subtle McDonald's knock-off called McPeak's. The prefix "Mc" appears in front of many of the menu items; they even serve "McBeer." McDonald's filed a lawsuit against them, but lost. I had a shwarma and a side-dish of some kind of middle-eastern pasta with vegetables. I also had a Pepsi. Dan had a McBeer. Afterwards, we head back to the flat. My Nook e-reader, which has been "rooted" - which is legally modified to expand its capabilities - occasionally has a hiccup. It took me a while to reboot it, but I got it squared away. There is no wifi in the flat, but Father Sergei has loaned us his USB phone connection so we can have Internet access. Trying to preserve his airtime, I get online briefly. 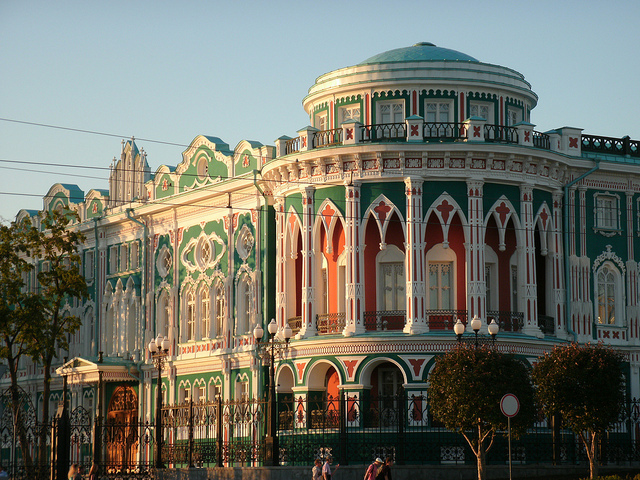 After taking it easy in the church flat, we will be going for a stroll around Yekaterinburg. Father Daniel, Father Alexey, Father Sergey, and I get into Father Sergey's car, and Sergey drives us first to a surprising monument near the main highway that goes all the way to Moscow. This memorial commemorates the deaths of innocent people killed in the concentration camps and the gulags. I have never heard that such a monument exists. 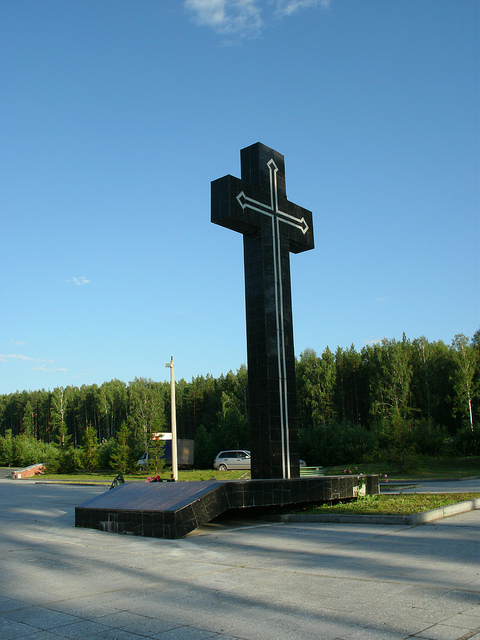 There is a large cross that dominates the vista of the park grounds. There is also a series of bronze plates carved with thousands of names and the dates they were killed. It is a somber reminder of the Stalin-era Soviet totalitarianism that was erected under the Yeltsin presidency. Father Alexey translates some of the stones for us, and takes pictures with his Nikon. 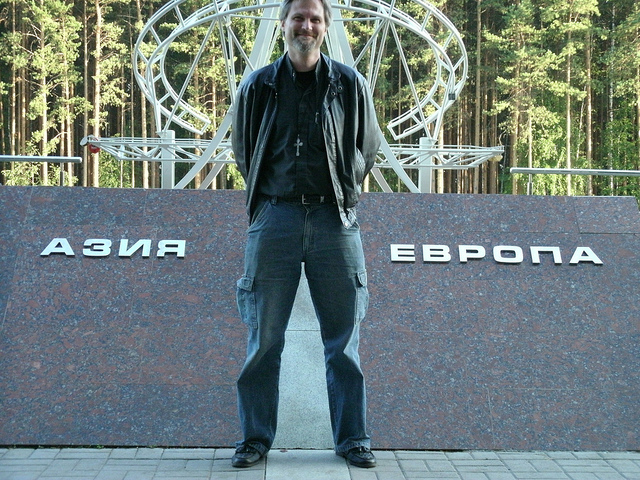 Next, we visit another monument (Russians are fond of visiting statues and memorials and posing for pictures - which was wonderful for me as a tourist) - one more frivolous than the last one. This marker demarcates the continental border between Europe and Asia. Here we take pictures, shoot video, and just plain goof off. There are often weddings here. There are mileposts indicating the distances to various cities around the world. We go downtown to where Yekaterinburg was founded. We visit the monument downtown to the two co-founders of the city - one of whom was a Lutheran. The center part of the city is absolutely beautiful - sporting both a river and a canal. The main street is called (what else?) Prospect Lenina. A lot of people are out and about, enjoying the gorgeous weather. We make a pilgrimage to the original location of Sts. Peter and Paul Lutheran Church - which, of course, was razed by Stalin. 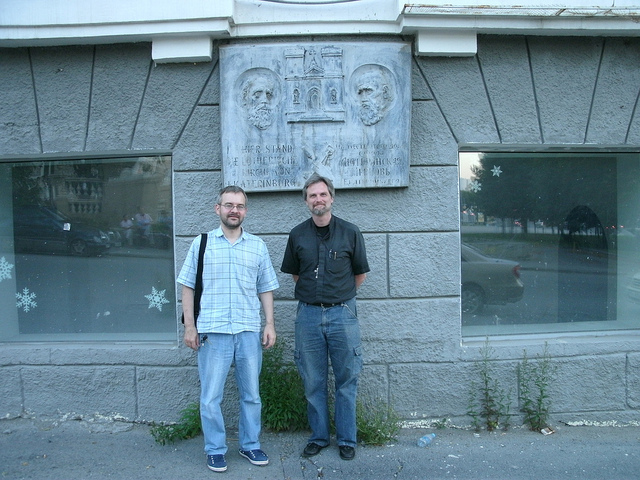 We take pictures under the plaque that commemorates the original site of the church. I took a picture with Father Sergey - the current pastor of this congregation, whose immediate predecessor was shot. We visit Father Sergey's office (he works a full-time secular job in Information Technology). There is an outstanding view of the city from his desk - five stories high. Father Sergey then drops us off at the church flat, where Father Daniel and I drink tea, eat cookies, and converse until about 1 a.m. Here is a link to all of my pictures of Day Eighteen.